USPA NEWS - The most beautiful Avenue of the World and the most frequented by Tourists in love with Paris was sacked by vandals on the occasion of the 18th event of the Yellow Vests (Movement which started on November 17, 2018 in France). Shocking images scroll on the screens of French TV channels, while amateur videos (which would be 1500 according to the figures of a police prefecture of Paris) circulate in social networks showing clashes between rioters and police. The most beautiful Avenue of the World and the most frequented by Tourists in love with Paris was sacked by vandals on the occasion of the 18th event of the Yellow Vests (Movement which started on November 17, 2018 in France). Shocking images scroll on the screens of French TV channels, while amateur videos (which would be 1500 according to the figures of a police prefecture of Paris) circulate in social networks showing clashes between rioters and police. 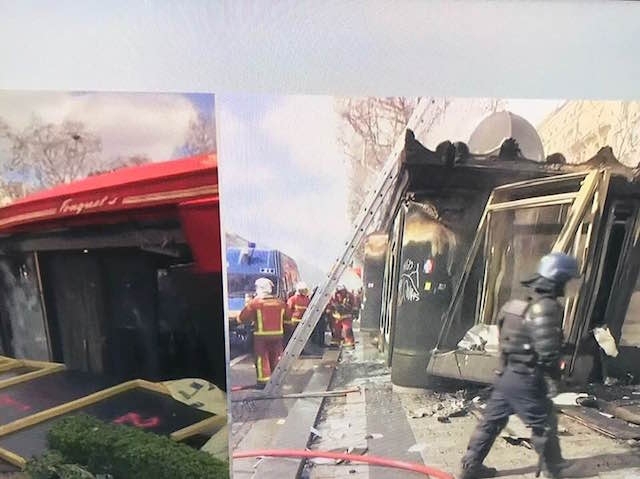 Today, late afternoon, the famous chic Champs Elysees restaurant in Paris, Le Fouquet's, was ransacked and burned by infiltrators in the Yellow Vests event. This iconic place by the frequentation of celebrities and in skating rinks of the big stars of the cinema, was set on fire at the end of the afternoon. (Former French President Sarkozy celebrated his victory in 2007). Other places such as luxury boutiques, including Zara, Lacoste, Nespresso, PSG have been robbed and vandalized, along the Elysees fields, as well as buildings housing banks. The police and firefighters also intervened and saves a woman and her child in a building in Paris 8th Street Franklin Roosevelt, which was burned. The demonstrations took place also in big cities like Bordeaux, Toulouse. 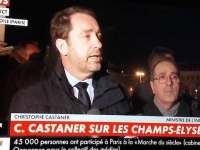 Interior Minister Christophe Castaner called the "Dozens of Assassins, who came to destroy the Republic" and promised that immediate appearances in court will take place very quickly. Four months after the birth of the movement and the end of the great national debate, scheduled for mid-March, the Yellow Vests had promised this Saturday a "renewed mobilization." This was the case, but with clashes and unprecedented violence delivering a spectacle of guerrilla scenes in the heart of Paris, on the most beautiful avenue in the world. VIOLENCE OF VANDALS VOLUNTARILY DESTROY CAPITALIST OR RICH SYMBOLS At the end of the day, an incendiary device fell on the blind of the terrace of the restaurant. Fouquet's Restaurant is a brewery listed in the inventory of historical monuments. It is attended by many personalities of the spectacle or politics. Nicolas Sarkozy had celebrated his election as President of the Republic. An evening that had been the symbol of his mandate. Other stores and offices were also burned during the day in the area of ​​the Champs-Elysees, including at least two kiosks. The restaurant Le Deauville was the target of incendiary device. As well as the Longchamp boutique. Fires were lit in front of shops Jeff de Bruges, Zara, Disney, Foot Looker and Léon de Bruxelles, shouting "revolution!" Launched by protesters. Many luxury boutiques, including clothing, have been looted.----------------------------------------------------------------------------- According to AFP sources, the riflers estimated at 1,500 according to figures given by the prefecture of the police in Paris, counted among them neighbors from Spain, Germany and Italy. 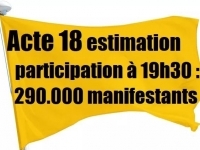 The Yellow Vests, have expressed their anger at the "National Debate" organized by the government and which they think it will be "nothing" and dissatisfied that the President of the Republic Emmanuel Macron, is currently in La Mongie, (Residence of the High Alps of the President of the Republic) or he went on vacation to ski. The intensity of the violence expressed on the Champs Elysee, was worthy of guerrilla scenes, even of civil war. 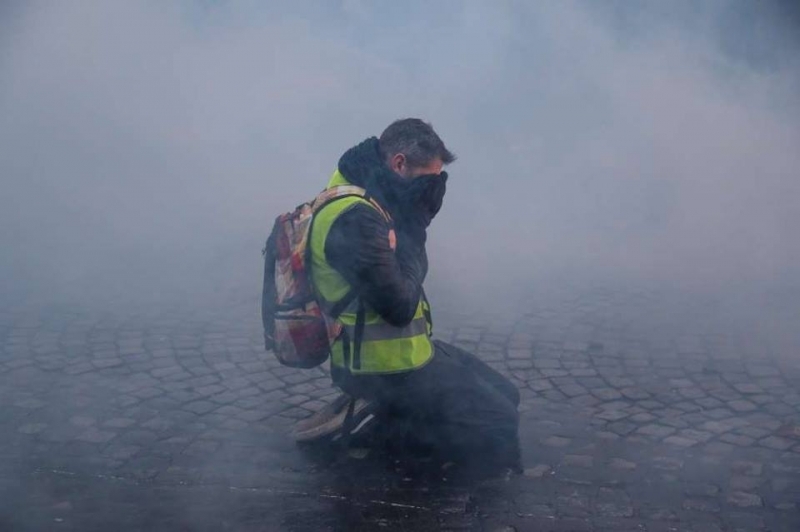 Some police unions have expressed their anguish at the fatigue of their police officers, who are on the ground demonstrations of Yellow Vests "since November 17, namely all els Saturday, non stop. Some demonstrators chanted "L'Elysée, l'Elysée! ", On the avenue des champs Elysee and towards the Elysee lais located at the bottom of this avenue. The police managed to stop them in this direction. Breakers entering the PSG shop threw balloons at the protesters gathered outside. In the late afternoon, she was turned into an infirmary by "street medic". Several barricades were inflamed while groups, chanting anti-capitalist and anti-police slogans, attacked the windows of the Hugo Boss, Lacoste, or Nespresso stores. These scenes of looting and clashes, reminiscent of the mobilization days of November 24 and early December, had not occurred for several weekend in the capital. For the time being, no quantified assessment of these damages has been made. 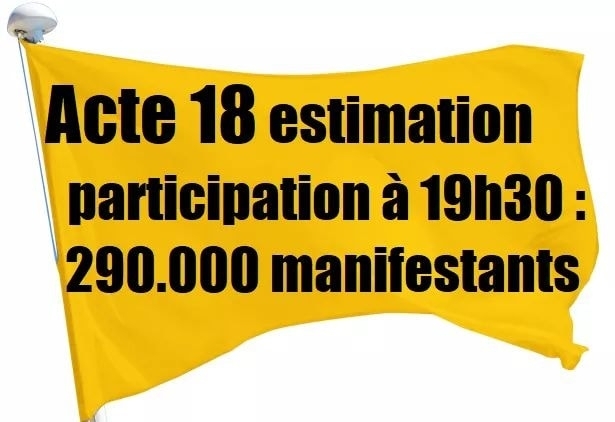 IN PROVINCE THERE WERE LESS VIOLENCE EXCEPT IN LYON WHERE THIS MADE QUIET-------------------------- We are at Act 18, the 18th Saturday of demonstration of Yellow Vests, Yellow Vests, act 18. 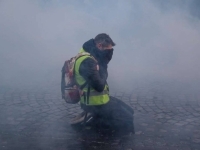 In several cities of France, the call to mobilize the yellow vests was once again followed ... and once again, tensions arose at the end of the rallies. In Bordeaux, Toulouse and Dijon, the mobilization continues with new clashes. In Lyon, the convergence of struggles prevailed calmly. 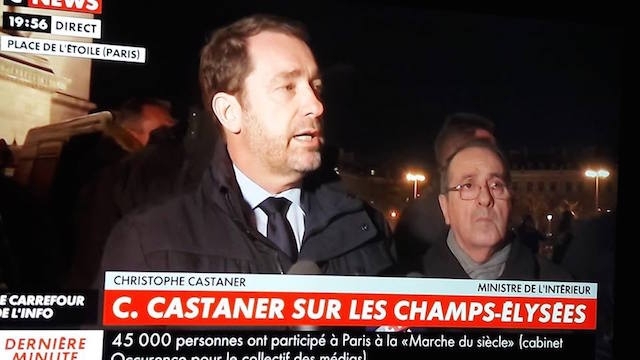 The 32,300 demonstrators (according to the figures of the Prefecture of Police of Paris) and 290,000 (According to them organizers of the Yellow Vests) have parade with little looting and violence compared to what happened in Paris, especially on the Chas Elysium. numerous acts of violence recorded in Paris and the Champs-Elysees, the rallies were marked 32 300 demonstrators throughout France, according to the Ministry of the Interior, and various incidents. A crisis Meeting was organized at 10:30 pm in Place Beauveau, by the Minister of the Interior (Who was held at the scene of acts of violence at 7h30 pm near the Arc de Triomphe to greet the police and their "Assuring his confidence") and of Prime Minister Edouard Philippe, causing the stop of the holidays of President Macron who returned to Paris of the evening, while the voices of the opposition criticize the executive and especially the management of the proud ones of the order is judged badly by the Minister of the Interior.